Mirima is a small Aboriginal community, located on the edge of the town of Kununurra in the Kimberley Region of Western Australia. In 1971, the Mirima Council under catholic priest Peter Willis was established. The community included mainly Miriwung and Gajerong people. 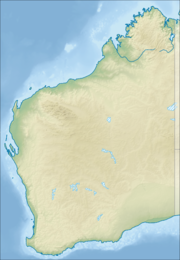 The ancestral lands of the Miriwung people are located near the southern part of the Ord River and therefore Miriwung people occupy the southern section of the Mirima community. The Gajerong people occupy the northern part of Mirima community. The community is covered by the Determined Miriuwung–Gajerrong (Western Australia) Native Title claim (WC94/2). The community is managed through its incorporated body, Mirima Council Aboriginal Corporation, incorporated under the Aboriginal Councils and Associations Act 1976 on 25 November 1986. Mirima Layout Plan No.1 has been prepared in accordance with State Planning Policy 3.2 Aboriginal Settlements. The Layout Plan was endorsed by the WAPC on 15 April 2003. ^ a b "Claimant summary - Miriuwung–Gajerrong #4". National Native Tribe Tribunal. Commonwealth of Australia. Archived from the original on 27 November 2012. Retrieved 14 January 2013. ^ "Certificate of Incorporation". Documents for Mirima Council Aboriginal Corporation. Archived from the original on 12 February 2014. Retrieved 14 January 2013. ^ "Mirima (Kununurra)". Planning Western Australia. Government of Western Australia. Retrieved 14 January 2013. This page was last edited on 28 February 2018, at 22:59 (UTC).